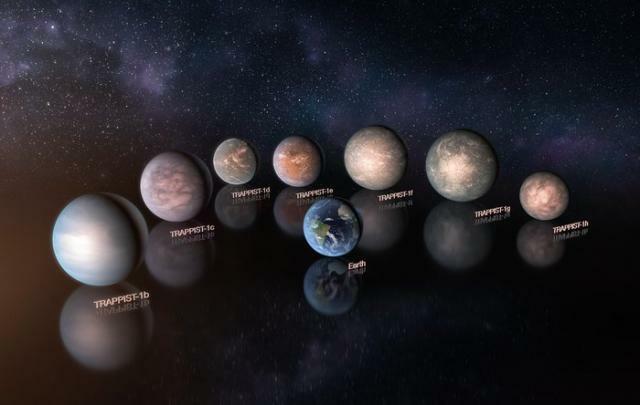 New research has shown that all seven planets circling around the cold dwarf star close to Earth TRAPPIST-1 consist mainly of rock rocks, and the water on some of them may be even larger than on Earth. The densities of these planets, which are now known with much greater accuracy than before, indicate that in some of them water can constitute up to 5 percent of their mass – about 250 times greater than the amount of water in the oceans of the Earth. The hotter planets located near their parent star are probably surrounded by a dense atmosphere of water vapor, while the farther ones are covered with ice. The fourth planet from the central star in terms of its size, density and the amount of light it receives is most like Earth. Of the seven planets of the system, it appears to be the largest in stone and potentially has water reserves. The planetary system of the dim red dwarf TRAPPIST-1, located just 40 light-years from the Earth, was discovered in 2016 with the help of the TRAPPIST-South telescope at ESO La Silla Observatory. Observations made the following year on ground-based telescopes, including the ESO Very Large Telescope, and the Spitzer Space Telescope (NASA), revealed in this system at least seven planets close in size to the Earth. The planets received the designations TRAPPIST-1b, c, d, e, f, g and h, in order of increasing their distance from the central star. After the ground-based telescopes, including the new SPECULOOS tool at the ESO Paranal Observatory, and the Spitzer Space Telescopes (NASA) and Kepler, new observations of the system were performed, a group of researchers led by Simon Grimm from the University of Bern in Switzerland applied to the data obtained by complex numerical simulation methods and determined the density of the planets of the TRAPPIST-1 system with much greater accuracy than was previously done. The measured densities in combination with the planetary composition models lead to the conclusion that the surfaces of the seven planets of the TRAPPIST-1 system are not just a bare stone desert. Apparently, they contain a significant amount of volatile substances, probably water, the amount of which in some of them reaches 5% of the planet’s mass. This is very much – for comparison, on the Earth water is only about 0.02% of its mass. TRAPPIST-1b and c, the closest to the central luminary of the planet of the system, most likely have a stone core and are surrounded by much denser atmospheres than the Earth. But TRAPPIST-1d is the easiest: its mass is only about 30% of the earth’s surface, and scientists doubt that it can have a noticeable atmosphere, oceans or ice cover. Astronomers were surprised to find that TRAPPIST-1e is the only one of all the planets of the system, whose density is somewhat higher than that of the Earth. This may mean that it may have a denser iron core, that it is not necessarily surrounded by a dense atmosphere that it does not have oceans or an ice shield. Mysteriously, TRAPPIST-1e is much more “stone” than all other planets of the system. In terms of the size, density and amount of energy that it receives from its mother star, this planet is more like the Earth than the rest. TRAPPIST-1f, g and h are so far from the central star that the water on their surface should freeze. If they have atmospheres, they are unlikely to contain heavy molecules, which are rich in terrestrial atmosphere, such as carbon dioxide.